Added pictures from the NYC premiere of the film at Cinema Village in the PRESS section of the site. Added a new section to the website entitled SEE IT. A statement about the film by Director Ted Schillinger has been posted in the ABOUT THE FILM section of the site. A new review of the film has been posted on the PRESS page. Theatrical Run Kicks off at Cinema Village (NY) on February 27, 2008. Don't miss it! 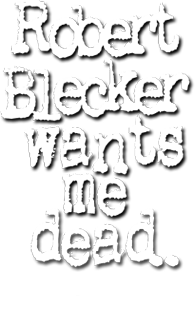 ROBERT BLECKER WANTS ME DEAD will be premiering at select theaters on February 27th 2009. Added the OFFICAL theatrical trailer in the TRAILER section. ROBERT BLECKER WANTS ME DEAD had its New England premiere on August 7, 2008 as an official selection of the Rhode Island International Film Festival. The Providence-based festival showcases quality cinematic work from around the world. This year, ROBERT BLECKER WANTS ME DEAD was one of 289 films selected to screen from a pool of over 3,000 submissions. Added premiere pictures from The USA Film Festival in the PRESS section. Added New York Times articles about the Holton murder case. They can be found in the PRESS section of the website. Updated Bio information for Director, Ted Schillinger in the CREDITS section of the website.